The LPC2468 Developer's Kit lets you get up-and-running quickly with the LPC2468 OEM Board. All relevant interfaces are available for evaluation or prototyping. Two 100 pos, 0.6mm pitch Hirose FX8C-100 connectors for OEM Board. USB device interface & connector. Full modem RS232 on UART #1. 0.3F capacitor backup for RTC. Color QVGA LCD expansion connector (serial and parallel interface options). 5 push-button keys (4 via I2C). Speaker output on v1.5 of OEM Base Board. All OEM Board signals available on expansion connector/pads. 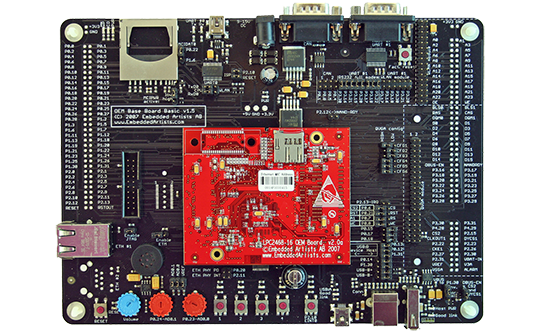 Note: Specifications for the OEM board is available on the LPC2468 OEM board page.